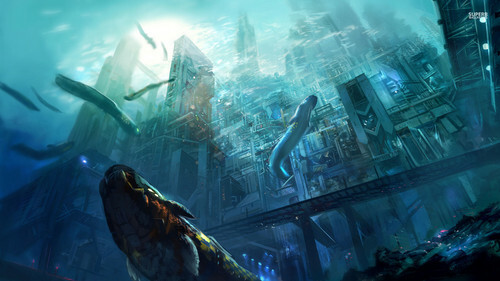 Underwater City. . HD Wallpaper and background images in the Fantasy club tagged: photo underwater city architecture sea ocean. This Fantasy wallpaper contains pacific sardine, sardinops caerulea, atlantic herring, clupea harengus harengus, herring, and clupea harangus. There might also be tuna, tunny, smelt, skipjack, skipjack tuna, and euthynnus pelamis.